SNews V1.4.3 News-Magazine Responsive Blogger Theme | BloggersStand ';-1!=b.indexOf("img.youtube.com")&&(a=' ');d=a+''+p+''+titlex+"
Download New Version SNEWS V1.5 Now ! To Download Snews V1.4.3 and V1.3 Just Drop Your Email in Comment Box or You Can Also Contact us Via Our Contact page. We promise You to Deliver Snews Blogger Template Within 24 Hours.Keep Visiting And Do Share Us ! Free Download SNews V1.4.3,V1.3 News-Magazine Responsive Blogger Theme,best blogger newspaper stlye magazine theme with shortcodes download for free demo. So Far 11 Comments on "SNews V1.4.3 News-Magazine Responsive Blogger Theme" - Post Yours! Hello ,daftar soal How Are you Doing ? 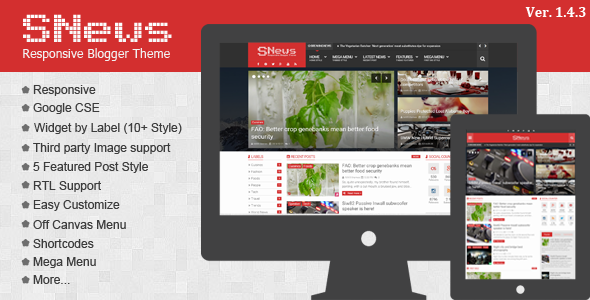 Kindly Check your Email we have sent Snews-V1.3 Responsive News/Magazine Blogger Theme Template !! Do Share Us and Keep Visting For More Stuff ! Hello ,How Are you Doing ? Kindly Check your Email we have sent Snews-V1.3 Responsive News/Magazine Blogger Theme Template !! Thank you, But you Can Send Me also Sevida V2.3.1 please. Hello ,Visuelhuda GA How Are you Doing ? Kindly Check your Email we have sent Snews-V1.3 Responsive News/Magazine Blogger Theme Template !! Hello we have already shared Snews V1.5 with you..do you still need 1.4 ?